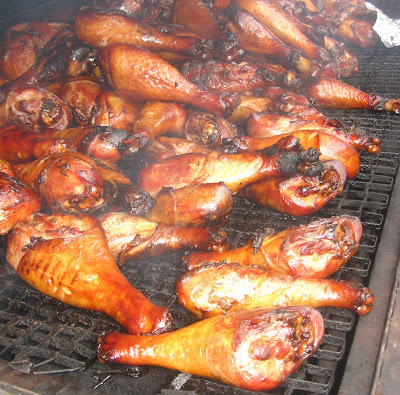 I was at a local food festival recently and noticed the beautiful grilled turkey legs one man was cooking at his food vendor tent. I snapped a couple of pictures, introduced myself and gave the food vendor my business card. I told him that I do some online food and cooking writing. "You don't know my name or my business, so you can't really write anything," he said. "You need a notebook and a pen and need to ask some questions." In fact, I had a notebook and four pens (always good to have back ups) in my backpack. Since I had a camera in one hand and an umbrella in the other, it was a tad difficult to get everything juggled around. Generally food vendors are friendly and have business cards. I can get details as needed by going online or by emailing or calling. I often mention various vendors here on the blog. One funnel cake guy emailed and asked to use my blog post on his web site. Sure. He even linked back which was terrific. I didn't ask though. I just blog and link things that I think readers would enjoy. Perhaps the Jerky Turkey guy thought that I'm getting rich writing about food. I do know one online foodie who makes a living writing about cooking online. Actually, he sells e-cookbooks and hard copy cookbooks, so that's where he turns his profit. The rest of the online foodies I know do it, because they enjoy it. They are not earning much (if anything) with online food writing. I can't fill up with one tank of gas during the month with online earnings. That's across a food blog and two websites. A decent day would be 30 cents on income. I'm not complaining. I'm just stating facts there. I go to various festivals and write about the food (and crafts and other things), because I enjoy doing it. It's my hobby. I have a day job. This is what I do for fun. I grill and share recipes and tips and also check out what others are doing as far as outdoor cooking. The festival was a day out with my family. I carried my camera along as I usually do. I spoke with several vendors at the festival and blogged with the event still taking place. People headed to the festival later in the day were reading and likely checked out some of the vendors I mentioned. The turkey leg guy might have sold some turkey legs to people who were reading and then attending. This would have been free advertising pure and simple. I didn't need or want anything from the Jerky Turkey guy. I just thought his turkey legs looked good. He was off the main drag at the festival. He didn't have any customers at the stand. A blog mention might have helped him out. Certainly, it wouldn't have hurt his business that day or in the future. I was thinking all this, but life is too short to worry about turkey legs. I thanked the guy and started to move along. If he didn't want advertising, that was fine by me. "Hey," he said. "You ought to get a leg. Then you can write a better story." "It's 10:45 in the morning," I said. "We haven't decided what we're having for lunch yet." Actually I'm not a big fan of turkey legs. They are OK, but they are not my favorite. My son does, however, love grilled turkey legs. He also lets me sample his food, so I can share more about what we see and do when we're out and about. Seriously now, did Mr. Turkey Jerk think that I'd want to do business with him after he'd been rude? Sure. I do some professional writing. It's not writing about turkey legs though. And, it's not on my free time out with the family. The turkey leg vendor lost a sale, and he lost free advertising. If you are a food vendor, maybe this post will help. It only takes a second to hand a food writer a card. If you don't have business cards, most food writers would be glad to write down your information or even let you write it down on the back of our own business cards. I know I've done that before. Everyone starts somewhere, and some vendors are new. They are usually very glad to get noticed and mentioned. I'm not saying the turkey leg guy owed me anything. It's his business. He can run it however he likes. But when someone is not asking for anything (and I never do) and when it could help sales, it really doesn't make much sense to be a jerk. Fortunately, this is the only food vendor I've ever spoken to who has been rude. Most food vendors are glad to meet and talk to people and are interested in getting some media attention (even when it's informal). There are several vendors that I look for every year and mention in my blog and on my websites. One guy that I always mention asked me this year if I sell grills or something. I smiled and told him no and that I'm JUST a writer. I really hate to put it that way - just a writer - but that's the reality. I don't have a stash of grills, sauces, rubs, cookbooks or anything else. I have a camera and a notebook, and I have fun talking to people and spreading the word about good eats. Well, I usually do anyway. I didn't much enjoy talking to the turkey guy. Somehow through my internet search for food vendors, I ended up here at your blog and really enjoyed this article. I currently work for a catering company that would LOVE some free advertising and is also looking for places (fairs, festivals, etc.) to be a food vendor at in order to increase their business. It's a small family-owned catering company in El Monte, CA that BBQs tri tip on a wood-burning grill which gives it a very unique flavor. If you have any suggestions, I would certainly appreciate your input. Always have business cards on hand. You never know when someone may want to follow up in some way. Other than that, I just hit it from the writing end. I get out and chat and then write. I wish you were on this coast. I would look for you at a festival etc. If, by chance, you do get out to North Carolina, let me know. Grill Girl: sounds like you have made the rounds at the local shows and events I have been thinking about getting into the food vendor business and was wondering if you had and good ideas for a product? hi i to go to many events and have only seen one grumpy food vendor. the lady was selling stuffed baked potatoes, had a line a mile long and was rude to every customer she served like they were an inconvienience to her day. The line became smaller as people decided to go to another booth. I was in the line at the ice cream trailer, the vendor was friendly and it tasted great on that hot summers day. Anyhow wanted to ask was the turkey jerk there the following year ? Mike you may have an opportunity !